Pat O'Mara's personal account of the anti-German Lusitania riots of May 1915 which broke out in Liverpool, taken from his autobiography The Autobiography of a Liverpool Slummy. This account is reproduced for historical record, indeed it should be taken as a given that Libcom do not agree with the nationalistic riots nor the imperialist 'Great' War. It was five o'clock one evening, and I was watching the home-coming dockers when a newsboy came racing down from Park Lane, yelling: "Sinking of the Lusitania!" The men stopped short; women peered from doorways. I joined one anxious group, poring over the fatal news. It was right - the 'Lusy', the fine boat I had left Joe and Harold aboard not two months ago, had been torpedoed! The news was only brief - she had "got it" in the Irish Sea bound for Liverpool "with terrible loss," the paper concluded. Later, another edition of the paper gave more tragic details. My mother was shocked by the news, especially as a very good friend of hers when she worked at the Emigrant House, a steward named Alfred Gilroy, was on it. She berated me when I touched her for entrance money to the Daulby Hall. "Here you are loafing around here and good men being sunk and shot and your poor sister and me working our hands off... Here, take it!" It took about two days for the names of the drowned among the crew to be published. They were appalling. That night Freddie and I, clad in our American tailored suits, started for a dance over Paddy's Market in St Martin's Hall. We never attended it, however. Before entering the Hall we walked around Scotland Road listening to the cries of the women whose husbands and sons had gone down in the 'Lusy' and we heard the bitter threats made against Germany and anything with a German name. We walked down Bostock Street, where practically every blind was drawn in token of death. All these little houses were occupied by Irish coal-trimmers and firemen and sailormen on the Lusitania; now these men who, barely two weeks ago, had carried their bags jokingly down the street were gone, never to return. Some of the women, drunk, were laughing – laughing as mad people laugh when the border line had been passed. Freddie, usually a very light-hearted boy, turned to me with a whitened face and said: “Listen to all them women crying!” On the corner of Scotland Road ominous gangs were gathering – men and women, very drunk and angry. Something was afoot; we could sense that and, like good slummy boys, we crowded around eager to help in any disturbance. Suddenly something crashed up the road near Ben Johnson Street; followed in turn by another terrific crash of glass. We ran up the road. A pork butcher’s had had its front window knocked in with a brick and a crowd of men and women were wrecking the place. A little higher up the same thing was happening – everthing suggestive of Germany was being smashed to pieces. Up the road the crowd surged, some cutting into Sawny Pope Street; others going into Ben Johnson Street; others continuing up the road. Down Scotland Road, in the opposite direction, the window crashing was more terrific – clear down to Bryon Street. Everyone had a brick or a stick or something tucked under his or her coat or apron and there was much pilfering. The police themselves, imbued with bitterness, were the most passive guardians of the law. I recall one stout little Irish sausage dealer pleading with the crowd that her husband wasn’t a German, but the name was too suspicious and in the windows went and the place was wrecked. Freddie turned to me: “What about all the ‘Uns up our way? I’ll bet they’re having some bloody fun up there now. Let’s go up there.” So we left the Scotland Road mob and took the tram up to our own South End. Scotland Road (1908). Perhaps the most famous of all Liverpool streets., Scotland Road was a teeming thoroughfare at the heart of the city's worst slums. Freddie had guessed correctly. As soon as the tram got near Charlie Beech’s pork shop, opposite St Vincent’s Church, a dense mob caused it to stop. Mr Beech had been living in Liverpool thirty odd years, but there was a faint suspicion that years ago, anticipating just such a riot, he had changed his name. His big shop was in shambles when, running from the halted tramcar, we got to it; Mr Beech and his son had made their escape. Someone in the mob mentioned Mr Agte was a retired German sailorman, now a naturalized Britisher, and married to the popular Sarah Doran, as Irish as a leprechaun. “Ah, lave thim alone!” said a Joan of Arc who was leading the mob. “Sarah allers hilped the church. Let’s get after Yaag – that’s the bloody ‘Un!” So instead of Agte’s we raced on to Yaag’s pork butcher’s in the Great George Street, most of us boys in the vanguard and anxious to be the first to crash the enemy’s windows. Mr Yaag, a big, wholesome fellow allegedly had been born in Germany, but I don’t think he remembered much about it. Two of his nephews were with my cousin Berny and the Eighth Irish over in France. I always liked Mr Yaag, but not quite so keenly as I liked to break his window without fear of molestation. As we converged on the big shop, Mr Yaag, arms akimbo and thinking some urchin was fleeing from Aeroplane Joe, came out, pipe in mouth and with his usual broad smile; this vanished instantly as someone kicked him in the belly and a volley of bricks sent in the huge windows. From the sawdust floor the astounded man had the pleasure of seeing his choice sausages kicked down and thrown about and the furnishings reduced to shambles. “You’ll sink the bleedin ‘Lusy’, will you!” yelled our Joan, waving a shillelagh over his prostate form. “I’ll give you sinking the bloody ‘Lusy’! ‘Ere, bust that up; kick that out; smash the whole bloody business!” We left Mr Yaag and Yaag, Inc., in a worse mess than Charlie Beech’s. Cook’s pork butcher’s in Mill Street came next. Mr Cook knew as much about Germany at the time, I think, as I did. Later investigation proved that he came from strictly Yorkshire stock and was a devoted student of Mr Kipling dashing off a bit of patriotic verse himself once in a while. But he had a pork butcher’s shop, and as pork and Germany were identical items, we left his shop in a shambles and himself stretched across the counter groaning. I began to get sick from all the free sausage I’d been eating. When all the pork butchers (the more obvious Huns) had been satisfactorily dealt with, attention was turned to private houses. It worked something like this. The mob paused panting for a moment and someone would address Joan of Arc: “You know that dirty auld man that lives in such and such a street. I think he’s one of them!” “I know he is!” someone who didn’t like this particular person would agree. Then off at a gallop. A rather pathetic case I recall was that of an aged couple who lived quietly in a house in Kent Street, just opposite St Michael’s Church. Of German extraction, they had lived so long in Liverpool they looked like natives. Moreover, they had taken out naturalization papers and were drawing their support from the Parish. At the moment our Joan converged on the front window with her trusty shillelagh, they were in the parlour singing Lutheran hymns. In went the front window as Mrs Seymour – our Joan – screamed: “You’ll seek the bloody ’Lusy’, will you? Then take that! And that! And that!” We left this old house practically wrecked, but no one hit the old couple. Our next conquest was Annie Monnigan’s little shack. Annie was just as Irish as Sarah Doran, German Bob Agte’s wife, but she didn’t contribute as generously to St Vincent’s and this made a big difference. Several reasons why Annie didn’t contribute so much to the church as Sarah was that she had no sailors’ boarding house, had six small children to feed, and her husband was interned. But she was quite as good a Catholic as Sarah. Years ago, she had married Charlie Thomas, fresh from a German four-masted barque. As the children came, Charlie quit the sea and matriculated, like all old sailors, to dock labouring – an occupation he was at when hauled off to the German detention camp on the Isle of Man. One of our crowd, with remarkable memory, verified this and the stampede was on. I shall never forget the hysteria of this last debacle, with the six children screaming and Annie, like a good colleen, fighting back and asking no quarter. After doing a second job here, we left loudly cheering our commander-in-chief, herself now sporting a black eye, given her by the fighting Annie. Next, of all places, was my German uncle by marriage, Chris Hazeman’s house in Chesterfield Street. Long afterward I was suspected of having suggested that the expedition go there, but it wasn’t true. I don’t know who started it – the only thing I do confess to was that when it was suggested, I seconded the motion. I remembered my beautiful Aunt Lizzie and a childish bitterness against the Hazemans grew rancorous within me. Now here was an opportunity to get even! But after we wrecked the little house that Aunt Lizzie loved so well (the Hazemans had fled when they heard we were on our way up there) I was glad she was not living then, otherwise she would have received the same fate as the other Irish girls whose husbands had become suspects. And so far on into the night our gang, along with several others equally patriotic, went through the slummy section of the town wrecking everything we tackled. Up in the North End it was the same way; the foe for the brief moment had changed from England to Germany. Many mistakes were made. Most of the slummy women already mentioned early in this book took an active part in the campaign and not a few of them dispatched themselves with signal valour. 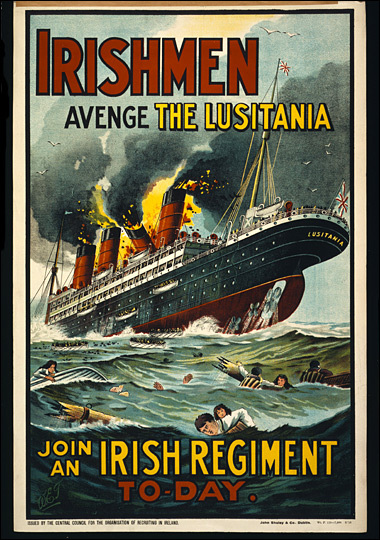 If the Germans had torpedoed the Lusitania, we certainly had torpedoed everything German in our immediate vicinity – certainly all the pork butchers’ shops. The following day all was quiet, and the police, now mindful of their jobs, started taking an inventory. All damage was carefully checked and all victims adequately reimbursed, the cost going on the tax rate as is the way with good British justice. Our commander-in-chief, the fiery little Irishwomen, was relieved from her chip-chopping activities and given six months in Walton for her valour, and only his adeptness at secreting himself behind the chimney pots saved the Black Prince from going along with her. Several others got minor sentences. There was some disguised blessings, too. Most of the wrecked butchers shops were obsolete contraptions, but when the reconstruction architects came in, newer and gaudier edifices were erected. Little fighting Annie Monnigan had always detested the little shack in Federick Street, so when the government offered to rebuild it according to the original plan, she threw up her hands in horror and suggested a cash settlement. Poor Charlie Beech and I were the worst sufferers. Charlie’s son John dropped dead after racing with his father from the shop to his house Aigburth; and I got a pernicious bellyache on account of all the raw sausage I had eaten. A large pork shop at the corner of Smithdown Road and Arundel Avenue had been absolutely wrecked. All the windows had been smashed and the stock commandeered or thrown into the street. Women hurled strings of sausages at one another and one women in a neighbouring street went down on her knees and scrubbed the pavement with a joint of pork. Other women went home with their aprons full of pork and bacon. After sacking shops, the invaders went into the living room upstairs and spread destruction everywhere. The piano was splintered to matchwood and hurled into the street. A man came to the gaping hole where the front window had been and, waving a handsome mirror over his head, smashed it to ragments against the stone still amid cheers from the crowd below.